A recent study from the University of Helsinki shows that the social gazing behavior of domestic dogs resembles that of humans: dogs view facial expressions systematically, preferring eyes. In addition, the facial expression alters their viewing behavior, especially in the face of threat. The study was published in the science journal PLOS ONE. The study uused eye gaze tracking to demonstrate how dogs view the emotional expressions of dog and human faces. Dogs looked first at the eye region and generally examined eyes longer than nose or mouth areas. Species-specific characteristics of certain expressions attracted their attention, for example the mouths of threatening dogs. However, dogs appeared to base their perception of facial expressions on the whole face. Threatening faces evoked attentional bias, which may be based on an evolutionary adaptive mechanism: the sensitivity to detect and avoid threats represents a survival advantage. “The tolerant behavior strategy of dogs toward humans may partially explain the results. Domestication may have equipped dogs with a sensitivity to detect the threat signals of humans and respond them with pronounced appeasement signals”, says researcher Sanni Somppi from the University of Helsinki. This is the first evidence of emotion-related gaze patterns in non-primates. Already 150 years ago Charles Darwin proposed that the analogies in the form and function of human and non-human animal emotional expressions suggest shared evolutionary roots. Recent findings provide modern scientific support for Darwin’s old argument. A total of 31 dogs of 13 different breeds attended the study. Prior to the experiment the dogs were clicker-trained to stay still in front of a monitor without being cued or restrained. Can people make their pets happy? Researchers from Nestlé Purina Petcare are conducting some of the first studies of their kind into how external stimuli can generate joyful emotions in dogs. While scientific evidence demonstrates that owning a pet can help lower people’s blood pressure, and reduce anxiety and depression, less is known about whether human contact has a similarly beneficial effect on animals’ emotional wellbeing. A technique being used in this research is thermal imaging: as blood flow changes to a part of the body, the temperature will also change. 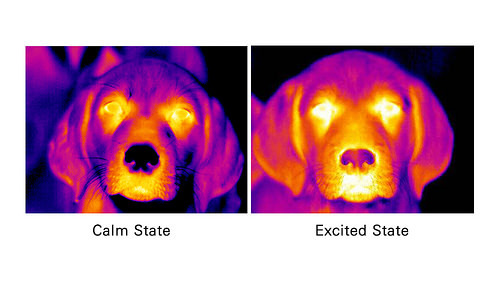 Researchers use a thermal camera to measure these temperature fluctuations in pets’ eyes, ears and paw pads. “Thermal imaging has been widely used in animal welfare studies, to assess inflammation in racehorses, for example, or to see how certain conditions affect livestock’s stress levels,” she continued.